Water Wise, Drought-Tolerant Turf for Utah and the Intermountain Region. Copyright © 2019 · Chanshare Farms Inc. When I first got married, 13 years ago, running was not in my physical vocabulary. I was fit due to other activities, but the joy of running eluded me. My wife, on the other hand, loved running. Shortly after we got married she invited me on a short run (2 miles). When we got done I felt like I had run around the world! In the last 5 years I began to understand the joy of running and even trained for and ran a full marathon (26.2 miles). It was extremely hard work, but I started out with manageable distances and finally worked up to race day. Just like training for a marathon, preparing your lawn for the long, strenuous summer months, requires training that starts now. 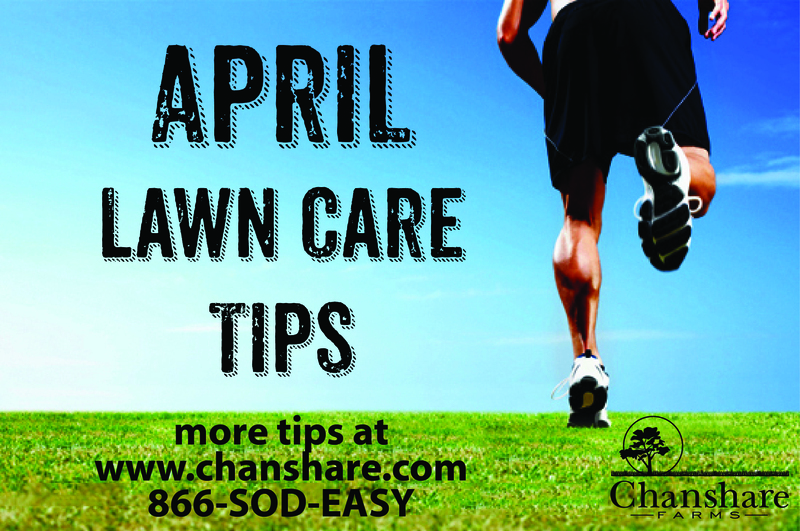 Here are April’s lawn care tips. Prevention is key! Eliminating things that would allow me an excuse not to run was key to training for my marathon. Similarly, taking care of weeds before they germinate is important. April is a good month to apply a pre-emergent herbicide and avoid weed infestations. Hydration cannot be ignored – Proper hydration during a long run is necessary for health. Excess hydration can cause cramps; minimal hydration can cause heat stroke. Your lawn can become a water hog if you over water. Due to the wet winter and spring you probably don’t need to water your lawn at all this month. The longer you wait to water, the greater the chance your lawn will extend its roots deeper into the soil chasing water. In April check your sprinkler system for leaks and misaligned heads. Just as I trained to run long distances, your lawn needs to be trained to be water-wise. This training needs to start now so that in the strenuous summer months it can thrive while using less water. In April, start slow. Don’t push your lawn to green up earlier than it naturally would by starting a regular maintenace schedule. Start with some small things this month and build up to more next month. Follow these tips and by the end of the year you probably won’t feel like you have run a marathon in your own yard. For monthly lawn care videos, watering and fertilizing schedules, and other water conservation tips check out chanshare.com or call 866-763-3279. Days get long, temperatures start rising and you can smell the earth wake up as Spring renews our world again. A gardener can taste the spring and breathing in the sunshine makes their fingers salivate in anticipation of tickling the earth again. March is a great month to start prepping your garden but the best thing for your lawn is to let it hibernate a bit longer. The way you treat your lawn in the spring may well determine how much water it requires in the summer. Here are a few tips on how to maintain your lawn in the spring. Don’t mow it yet! Cool season grasses have a growing cycle that starts rapidly in the spring, slows in the summer, and gains speed again in the fall. As soon as you mow your lawn in the Spring, the plant has to take its focus off wiggling its roots down further into the earth and expend its energy on growing blades. The longer you wait to mow, the deeper your roots can grow, and deeper roots can draw from a larger water table in the summer. Now, if you just can’t stand the brown winter grass any more, start mowing and the lawn will green up lickity split. Rake out excess thatch. Snow can cause the blades to lay flat and leaving them that way makes conditions ripe for snow mold. Now is a good time to remove excess thatch from your lawn. Going over your lawn with a metal rake and bagging or using the clippings for mulch will give air, water, and nutrients easier access to the roots. Wait to feed your lawn. The most important time of the year to fertilize is in the Fall. If you put a winterizer fertilizer on your lawn around Halloween last year, your lawn shouldn’t need to be fertilized again until Memorial Day. If you didn’t apply a winterizer fertilizer last season, a 16-16-16 fertilizer will add strength to root and blade. Wait to apply until shortly before you start watering. It is a great time for weed control. Per-emergent herbicides, applied early in the spring, prevent weeds from infiltrating your lawn. DO NOT WATER! Stressing your lawn in the Spring is a great way to force it to develop a strong root base. After a wet winter you shouldn’t need to add any irrigation to you lawn until the middle or end of April. Setting your system to water before mid April generally proves to be unnecessary. Follow these tips and you will be prepping your lawn to be healthier and require less inputs (water, fertilizer, etc.) throughout the year. Let the lawn sleep in a few weeks longer and you will have a healthier lawn in the summer. 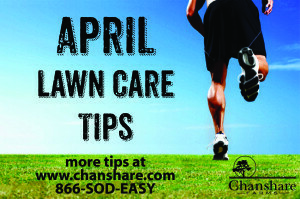 For more tips download Chanshare’s Lawn Care Guide at www.chanshare.com , check out our Youtube channel, or call 866-SOD-EASY. 1. Water your lawn when you can see it starting to go gray. You should apply about 1″ every 6 or 7 days. 2. A light fertilization is OK at the beginning of the month. Look for a balanced blend like 16-16-8. 3. Raise the height on your mower to 2.5-3″. Longer blades of grass will help shade the soil and minimize evaporation. 4. July and August are good months to stress your lawn by minimizing watering. If you do this your lawn will start to brown-out. You should return to regular watering within 4-6 weeks.